In response, scientists are taking a stand. They are defending their work against what appears to be a new, more aggressive assault in the so-called “Republican war on science,” as the president threatens deep cuts to federal funding of scientific research. Before dismissing this recommendation as a perverse appeal to slink into the mud or take up the corrupted weapons of the enemy, keep in mind that in academia, “rhetoric” does not mean rank falsehoods, or mere words over substance. Rhetoric is one of the original seven liberal arts. Aristotle defined it as “the faculty of observing, in any given case, the available means of persuasion.” Scholars like me who study the rhetoric of science analyze and evaluate the persuasive communication of scientists. Although it draws from an ancient tradition, rhetoric of science is a relatively young field of study. It was born in the late 20th century, after historian of science Thomas Kuhn introduced the idea that science develops not through the steady accumulation of facts, but in revolutionary moments. With a paradigm change, the heliocentric model of Copernicus replaces the geocentric model of Ptolemy, Darwin’s natural selection overturns natural theology, plate tectonics wins over the theory of a stable Earth. Kuhn’s call for a study of “the techniques of persuasive argumentation” within scientific communities that settle conflicts between paradigms introduced the “rhetorical turn” in science studies. Rhetoricians enthusiastically took up the call to look at the way that language and culture help to shape knowledge. At first, this kind of scholarship seemed hostile to scientists. 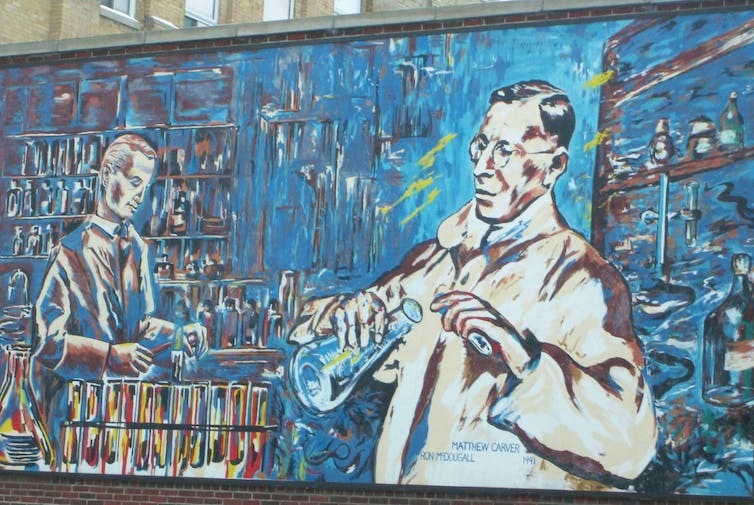 In the age of “alternative facts,” it is worth remembering that for most of the 20th century, the image of the scientist as American cultural hero was ascendant. In the latter part of the 20th century, when scholars began pointing out that the most effective scientists were those who were also the most effective rhetors, the validity of scientific theories and the institution of science itself seemed to be under attack. Rhetoricians got caught up in the “science wars” between postmodern deconstructionists and natural scientists. They were viewed with distrust by defenders of science. But times changed. In the early years of the 21st century, the two cultures of the humanities and the sciences found themselves united against forces that would starve higher education of funding. Many rhetoricians began to see their mission not as taking scientists down a peg or two, but as helping scientists improve their public communication. For example, Celeste Condit draws from the rhetorical tradition to help medical geneticists appreciate the importance of understanding their audience. Scientists should be careful not to underestimate the public, which “knows a fair amount about the basics of heredity.” But neither should they neglect how certain terms affect the public mind. When telling individuals they have a genetic predisposition to cancer, for example, “version of a gene” is a less scary use of words than “mutation,” which evokes horror movie monsters. Condit’s students, Marita Gronnvoll and Jamie Landau, explore the problems and potentials of the most frequent metaphors used by the public to discuss genes, such as ticking time bombs and Russian roulette. They recommend that scientists introduce new, more accurate and less alarming metaphors that call to mind the choreography or orchestration of a gene/environment interaction. Von Burg points to scientists who used this strategy effectively when responding to critiques of climate disaster movie “The Day After Tomorrow.” Climate skeptics denounced the blockbuster as hyperbolic. Climate scientists agreed that its story line about instant climatic shift was absurd. But they also argued that the overall message that climate change requires our attention was “not untrue.” “The film is not scientifically invalid” insofar as the events it depicts – melting ice sheets, powerful hurricanes – are likely to occur, but just over a longer time frame. Ethos, or the speaker’s development of a trustworthy character, is another important concept that rhetoricians share with scientists engaged in public debates. Jean Goodwin has studied how scientists can reach out to skeptical listeners with appeals that signal their vulnerability rather than their superiority. Observing climate scientists speaking to skeptical audiences, she has found that one must give trust in order to receive it in return. Some of my own research focuses on how to counter a manufactroversy: when the public has been told there’s a dispute within the scientific community when there is actually a wide consensus. In these cases, those who would manipulate the public set argumentative traps. One way for scientists to avoid these traps is to point to the history of scientific debate that resulted in the consensus of experts. Sharing such rhetorical strategies is my way of helping climate scientists, as well as experts responding to those who deny the safety of vaccines, or the link between a virus and a disease. When scientists gather to march for science, I want them to know about this body of research. In addition to carrying signs, they can take up the toolbox of effective communication known as the rhetorical tradition. Rhetoricians will be marching by their side, allies in the battle to protect science from politically motivated attacks on one of the greatest treasures of the nation. Leah Ceccarelli does not work for, consult, own shares in or receive funding from any company or organization that would benefit from this article, and has disclosed no relevant affiliations beyond the academic appointment above. This article originally appeared at The Conversation. Leah Ceccarelli, Professor, is a rhetorical critic and theorist. Her research focuses on interdisciplinary and public discourse about science. She also explores metacritical issues surrounding rhetorical inquiry as a mode of research.